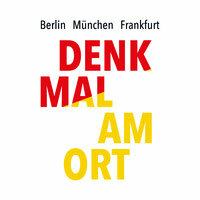 Denk Mal Am Ort (DMAO) is the personal remembrance of an individual or family persecuted in Berlin during the Nazi era. We want to commemorate these people each year in the neighbourhood of Berlin where they lived, specifically the weekend closest to the day World War II ended in Berlin. This year it falls on 4 / 5 May. The DMAO project was inspired by the OPEN JEWISH HOMES project initiated by Dutch activist Denise Citroen: Every house has a story to tell and it is good to shed more light on this once a year. Denise Citroen launched the project in 2012 in cooperation with the Jewish Historical Museum in Amsterdam. Marie Rolshoven, Jani Pietsch and Florian Voss brought the idea to Berlin in 2016, extending commemoration to include anyone persecuted by the Nazis.